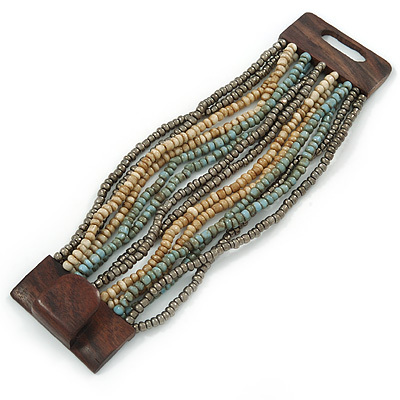 Complete your look with this fancy Dusty Light Blue/ Metallic Grey/ Antique White Glass Bead Multistrand Flex Bracelet With Wooden Closure. Featuring a multistrand flex design, made of glass beads in hues of metallic grey, dusty light blue and antique white. The bracelet measures about 19cm in length and about 50mm in width. Fastens with a large brown coloured wooden, square, hook and loop style closure. Also, check our store for a matching necklace N02822.